Woodhouse Kitchen + Bar is one of those unique places; boasting fresh, locally sourced and organic ingredients, the Eastern European/ New American inspired menu is bursting with unique flavors. Whether it be homemade pierogies, specialty beetroot salads, eccentric cocktails, or a classic cheeseburger, Woodhouse delivers flattering tastes, all the while paired with a warm, welcoming atmosphere. Recently celebrating its first year of business, Woodhouse is seeing tremendous success. 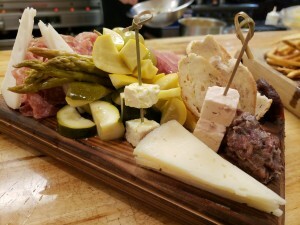 Located in Mason, OH, at the King’s Mill road exit off I-71, Woodhouse’s general manager, Amber Phillips, describes it as….”Traditional – we want to bring old flavors back, but give them a new spin.” Yury Pivor, the owner, has plenty of experience running restaurants, with Woodhouse being his most recent startup. In the kitchen, Executive Chef Matthew Schroeder’s menu is designed to accentuate the flavors of the locally sourced ingredients, and their seasonal menu reflects this dedication. More than a restaurant, Woodhouse Kitchen + Bar has several indoor and outdoor private and semi-private event spaces where they host events, ranging from birthdays, graduations, and weddings rehearsals. With a technologically-equipped private dining room, they host luncheons, company meetings, and rehearsals, as well as offering catering services.